"Stop talking! You're supposed to be working on language!" From the moment they are born, we encourage children to talk. We enunciate for them, applaud their expanding vocabularies, and hang on their every word ... that is, until they enter school. At that time, we expect them to stop talking and measure their language abilities through a new medium, writing. While the educational system focuses on the written product as the sole measurement of language development, many children fail to measure up to established standards. Why? Because, Davis observes, writing is not our first communications tool; for most of us it functions as a "foreign language." The problem is, individuals are not capable of "creating" or "thinking" within a foreign language. 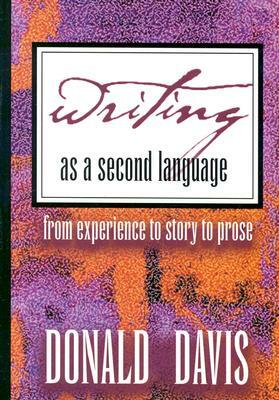 Davis argues that we must step back into our familiar "first" language-the spoken word-as our creative medium and learn to "translate" into that new foreign language called writing. With enough success, writing will eventually become a second language, instead of a foreign language. When we talk about language arts in our school, we focus on reading and writing instead of nourishing the whole oral and kinesthetic package which is our spoken language. Davis argues that talking and writing need not be mutually exclusive in language development. In this book, he lays out the method he has used in countless residencies in schools across the United States, working with adults, teens, children, and teachers. DONALD DAVIS grew up in a family of traditional storytellers in North Carolina. After twenty years' service as a United Methodist minister, Davis became a full-time storyteller, now giving more than three hundred performances each year. He has served as guest host on American Public Radio's “Good Evening,” and appeared on CNN and “Nightline.” He is the author of seven books, incluiding Listening for the Crack of Dawn and Telling Your Own Stories, as well as seventeen audiocassettes such as The Big-Screen Drive-In Theater and The Grand Canyon.